Sentry Ultraviolet Light Systems For Commercial Pools - ChlorKing, Inc.
ChlorKing®’s line of SENTRY ultraviolet light (UV) pool sanitization systems are designed and manufactured specifically for commercial swimming pools and spas. 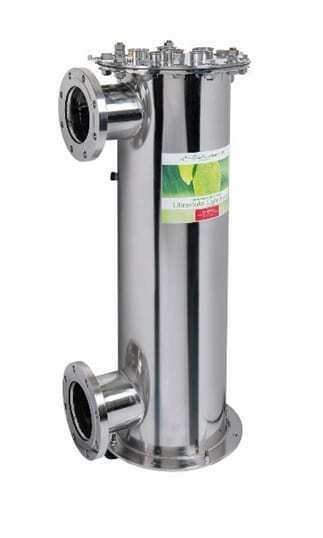 This cost-effective line of low-pressure, high-output amalgam systems offers complete chloramines control for your indoor facility, as well as protection from pathogens such as cryptosporidium, e-coli, etc. Using patented, quick-disconnect assemblies, our line of ultraviolet light pool sanitization systems offer the easiest disassembly/assembly available and make getting to the quartz sleeves and lamps a simple task. ChlorKing® SENTRY ultraviolet light pool sanitization systems are designed to treat water from 50 – 1,600gpm (model specific) and are a fraction of the cost of higher-priced medium-pressure systems. All models operate at 120v with a maximum of 12amps, making this line of UV systems very cost-effective to operate and maintain. Lamps are rated for 13,000 hours (over twice as long as comparable medium-pressure systems). ChlorKing® SENTRY ultraviolet light pool sanitization systems offer another unique benefit when using our dual output lamp technology: While UV is being produced at 254nm, ozone is also being produced at 185nm, adding to the sanitization of the water flowing through the chamber. This additional sanitizer helps reduce the amount of chlorine a pool or spa requires.